With Jack Frost nipping at our toes, the time for warming, hearty comfort food is most definitely here. And if it’s quick and easy to rustle up, so much the better. It’s been another fantastic month for the Recipes for Life challenge. I must admit, when I was first told the three ingredients the SWALLOW cookery club had decided on for April, I wasn’t sure how many recipes we’d receive. But as ever you lot have excelled yourselves and we’ve ended up with an incredibly varied and mouthwateringly tempting array of dishes all using the three set ingredients of pork, sweetcorn and tomatoes. I got things started with these Rosemary and Garlic Pork Chops with Roasted Corn on the Cob and Spicy Tomato Relish. Roasting the corn gives it an extra sweet intensity and make sure you serve it with lots of lovely mashed potato to soak up the juices from the pork and the butter from the corn. Don’t these Slow Cooker Sweet & Sour Sausages from The Crazy Kitchen look good? The list of ingredients might look long, but don’t be fooled – this is a quick and easy dish to prepare, just perfect for a midweek supper. And what’s more it’s a very frugal dish, making one pack of sausages go a long way. The whole family loved it. Sarah’s chilli is a feast of colours, flavours and textures, and perfect for little ones as it has just the right level of spice without being too hot. Next up is a dish that’s making me yearn for summer! Doesn’t your mouth just instantly water when you look at Under The Blue Gum Tree’s gorgeous photos of her sumptuous BBQ Pork Ribs with Sweetcorn Salsa? The ribs are smothered in a simple BBQ sauce made from store cupboard ingredients – the trick is not to marinade the ribs but instead to pour the sauce on for the last 10 minutes of cooking time – and served with a zingy salsa made from roasted corn and fresh tomatoes. JibberJabberUK has come up trumps with this satisfying Slow Cooker Pork Creole – as she says it might not be 100% authentic, but it’s a great way to add a bit of spice to your family’s food. It’s an incredibly versatile dish, so you can throw in whatever vegetables you happen to have in the fridge or freezer. You may recall that Helen from The Crazy Kitchen entered not one, not two, but three dishes into last month’s Recipes for Life. And she’s worked her magic again! This Sausage Pesto Pasta is her second entry for April’s challenge and I know my own family would absolutely love this. The recipe is simplicity itself but you just know it’s packed with flavour and would satisfy even the grumbliest of tummies. 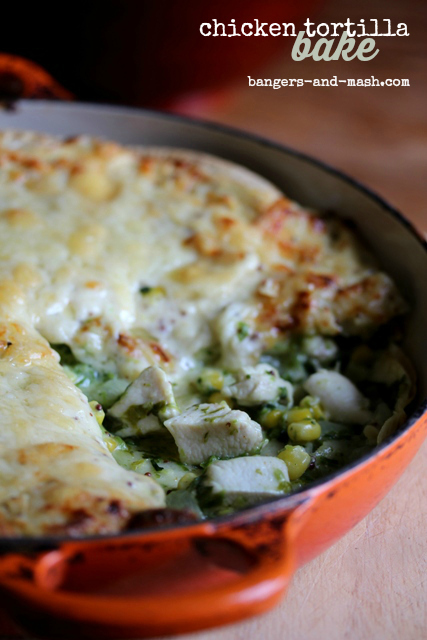 And for her third offering, Helen from The Crazy Kitchen brings us this ever so easy Oven Baked Tortilla – a great one-pan meal, which Helen says is one of her favourite dishes to prepare when they’re away on holiday as it’s just so simple to do. The brilliantly named Fun as a Gran came up with a wheat, egg, dairy and gluten-free dish of Pork, Sweetcorn & Tomatoes with Vermicelli Rice Noodles. I love the fact there is “no fancy measuring” and the recipe can be adapted up or down at the drop of a hat to cater for any number of people staying for dinner. Here’s a great first-time entry from Spurs Cook: Pulled Pork Wrap with Tomato and Chorizo Salsa and Sweet Sweet Sweetcorn. I’m a big fan of slow-cooked pork, especially when it’s seasoned with a whole host of rich, warming spices like paprika, cumin, cayenne, chilli and fennel, and I’m intrigued by the idea of the sweetness of the sweetcorn intensified even more with the addition of honey. Got to give it a go! My Cheat’s Ciabatta Pizza is the next entry and to be honest hardly deserves to be described as a recipe as it’s just so easy to make. It’s simply sliced bread with your favourite pizza-style ingredients chucked on top and either grilled or baked in the oven. A quick and easy dinner to throw together when you don’t have time to make your pizza dough from scratch. And last but most certainly not least is a second entry from Fun as a Gran – Red Rice Accompanied by Pork, Sweetcorn and Tomato – another dish that’s easily adaptable depending on what you happen to have in. It features lovely nutty red rice served alongside pork steaks in a sauce made from a can of chicken or mushroom soup. It reminds me of some of my favourite student recipes! 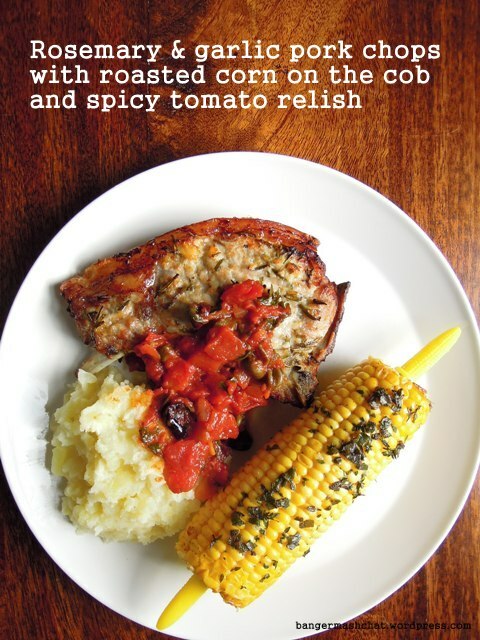 Well, who would have thought pork, sweetcorn and tomatoes could lend themselves to such very different dishes? I look forward to working my way through these over the coming weeks. Helen from The Crazy Kitchen for her Oven Baked Tortilla! Huge congratulations to Helen for her well-deserved win, particularly as this means she’s now scooped first place two months in a row! The guys at SWALLOW said they liked her tortilla because it features a good selection of veggies and was just a little bit different. Special mentions also go to Under The Blue Gum Tree’s BBQ Pork Ribs and Chez Foti’s Retro Sweet & Sour Pork, which the group said both looked and sounded gorgeous too. So well done again to Helen – a little gift will be coming to you in the post in the next few days. Watch this space to find out the three set ingredients for May’s challenge, and let’s see if we can knock Helen off the coveted top spot – surely she can’t make it three in row? Or can she?! If you’d like to find out more about the work of SWALLOW and perhaps get involved in their Twenty for 20 appeal as part of the charity’s 20th anniversary celebrations, please take a look at their funky new website.